In love with Formula 1: Azerbaijan GP / Qualifying: Frighteningly fast Hamilton stormed to pole! Azerbaijan GP / Qualifying: Frighteningly fast Hamilton stormed to pole! This was only the second time, that the Formula 1 circus moved to Baku, Azerbaijan. The street circuit is known for its combination of long straights and 90-degree corners. The narrowest point of an F1 circuit can also be found in Baku; this looks narrow indeed for the modern wider F1 cars! Already the free practice sessions had proved, that it was extremely difficult for the drivers to get both the tyres and the brakes up to the ideal temperature. All drivers had been struggling with poor grip, so escape roads were taken by most drivers at some point. Sebastian, for example, had had to use reverse three times during Friday, which is quite rare, when talking about F1 cars. These features made also qualifying different. Everyone came out on the super soft Pirellis already at the beginning of the first session, as it could easily take five or six laps, until the tyres were up to the optimal temperature. So there weren´t two separate attempts, like usually, but actually only one longer run. Hamilton showed the potential of the Silver Arrows by topping the time sheets by half a second to Red Bull´s Verstappen. The Ferrari partners Kimi and Sebastian were 3rd and 5th. Ericsson was the lone Sauber eliminated in Q1 as teammate Wehrlein had produced a great 15th fastest lap. Out of Q2 were also McLaren teammates Alonso and Vandoorne and Grosjean in his Haas. Renault´s Palmer was out of the qualifying due to the FP3 fire in his car. Red Bull´s Verstappen had suffered from reliability issues already in the FP3, and the flying Dutchman´s problems continued in the qualifying. In spite of reporting of a power unit related problem on the team radio in Q2, the Dutchman managed to set a 4th fastest lap time. In addition to the Dutch Red Bull ace, also Massa in his RW38 had a moment of scare, as they both lost control of their car for a second and almost brushed the wall. Hamilton, whose pace had seemed to be missing in the free practices, definitely "found his performance" in Q2, as the Briton took everyone´s breath away by an outstanding lap. Teammate Bottas was two tenths off Hamilton´s pace. Mercedes seemed to be clearly ahead of their rivals in terms of pace, but Ferrari and Red Bull seemed quite evenly matched. The Toro Rosso boys Kvyat and Sainz were the first fallers in 11th and 12th. Also Magnussen (Haas), Hulkenberg (Renault) and Wehrlein (Sauber) were eliminated in the second session. The shootout for pole was breath-taking. Mercedes´ Bottas seemed to be at home on the narrow and slippery streets of Baku, and the Finn went fastest on his first run, in spite of slightly kissing the wall! Hamilton made a mistake in the last sector, which made him 0,15s short of provisional pole. Sebastian´s hopes of a competitive lap time ended in the Turn 2 escape road. Considering the challenging circumstances, it wasn´t surprising, that the decisive last session was red-flagged! Ricciardo´s Red Bull stopped in Turn 6, after he broadsided and brushed the outer wall; at this point there were 3 minutes and 33 seconds remaining! Bottas was topping the time sheets with teammate Hamilton second, Verstappen third, Kimi fourth, Ocon fifth and Sebastian sixth. Neither Williams had run by this stage. The question during the 9-minute delay in everyone´s mind was: Would anyone be able to reach sufficient tyre and brake temperatures to improve in the closing stages of Q3? My answer was no, but look, how things turned out after all! Bottas managed to improve his lap time on his final run; in spite of a staggering lap it wasn´t enough to get the Finn on pole. I don´t know where Hamilton found his pace, but I have to say, that the Briton was frighteningly fast today! He conquered pole by almost half a second to his teammate! Red Bull saw their second-row slot disappear as both Kimi and Sebastian improved. Kimi was impressive third, although the Iceman was already over a second off pole-setter Hamilton. Sebastian qualified fourth, only a tenth off his teammate´s pace. Verstappen had an issue with gear sync on his final run, and the flying Dutchman had to settle for P5. "The power of the pink" was also there, as Perez qualified 6th and Ocon 7th. Eye-catching was the fact, that Lance Stroll (P8) had made it in Q3 only for the second time in his F1 career and also out-qualified his teammate Massa (P9). I´m sincerely happy for the Canadian, who has had more than his share of criticism in the first half of the season. About tomorrow´s race then: Who will be the first driver to crash into the wall? I´m sure there will be some drama in the race. I am also very aware of the frightening pace of Hamilton, who will start the race on pole. Sebastian has to take a phenomenal start from P4 to challenge the Briton, and he has to fight like a lion to keep his lead in the drivers´ championship standings! Sebastian has to attack on the opening laps, as it seems more difficult for Mercedes to get the tyres up to temperature. I´m definitely looking forward to a thrilling race! 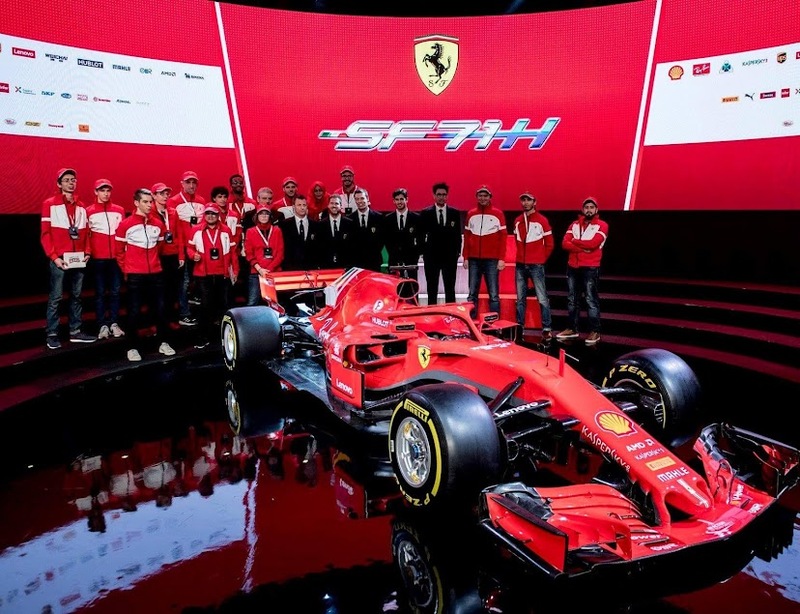 I believe in the red-suited warriors; I know that they will do everything to extract the maximum out of their SF70-H. Forza Ferrari!